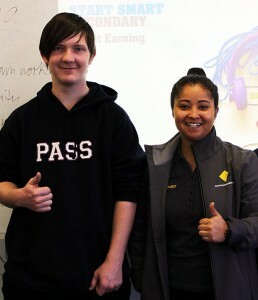 YES Centre Year 11 student Ethan with Start Smart facilitator Ms Leana Mulyono. YES Centre students learned how to be make smarter decisions regarding spending and saving money in a presentation by Start Smart facilitator Ms Leana Mulyono on Thursday, August 24. The Start Smart Secondary Program is run by the Commonwealth Bank and is designed to give students the knowledge to help them make wise financial choices. It looks at common financial issues faced by students. Topics covered include getting your first job, managing your mobile phone, setting savings goals and budgeting. Students look at their current spending and habits and are encouraged to question their purchases and understand the implications of their decisions. Concepts covered include financial responsibilities, emotional motives, influences on spending, the difference between needs and wants, your first job, employee rights and responsibilities, award wages, the value of saving, and strategies for spending smart.